The big news regarding theme parks of course was the July 8 opening of Diagon Alley, the new expansion of The Wizarding World Of Harry Potter in Universal Studios Orlando. 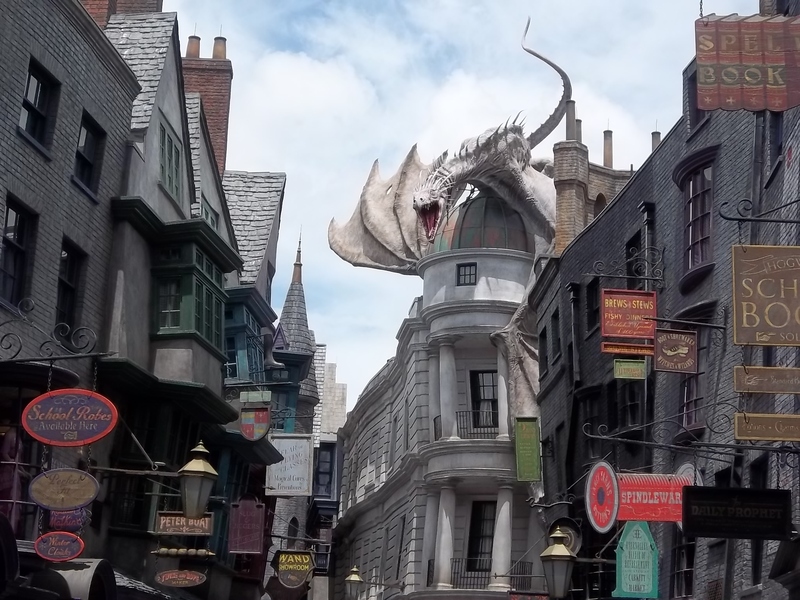 Based on the popular Harry Potter book and film series Diagon Alley is an immediate hit with parkgoers and Harry Potter fans. The newest land added to Universal Studios Orlando consists of the hidden wizarding alley found in London, England. 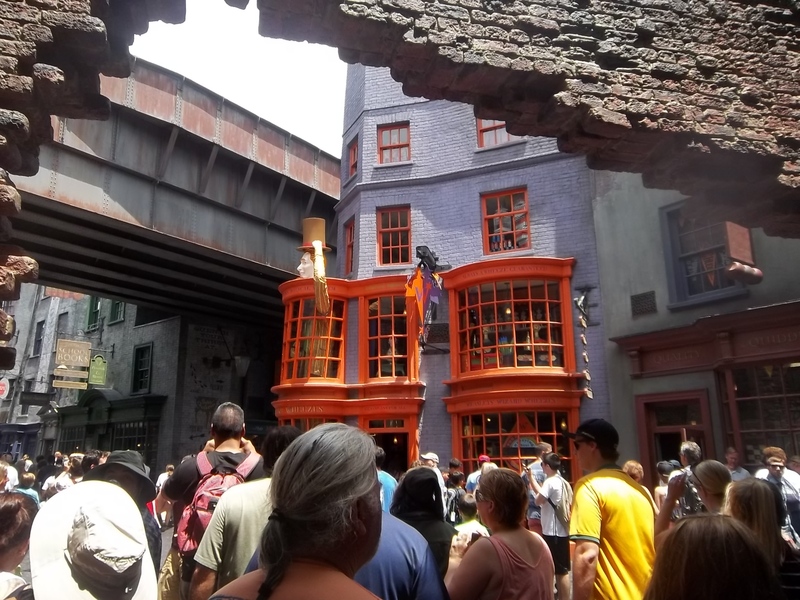 Adorned with cobblestone streets and maze-like alleyways and streets, Diagon Alley boasts several shops and as the centerpieces Harry Potter And The Escape From Gringotts ride and the Hogswarts Express train that connects Universal Studios Orlando with Islands of Adventure. After the runaway success of Islands of Adventure’s The Wizarding World of Harry Potter, an expansion was fastracked by Universal Resorts. But instead of just encroaching the faithfully recreated Hogsmeade village into other areas of Islands of Adventure, the innovative idea of putting the expansion into Universal Studios Orlando was utilized instead. The expansion can be found next to Disaster! at the area where the old Jaws ride was located. 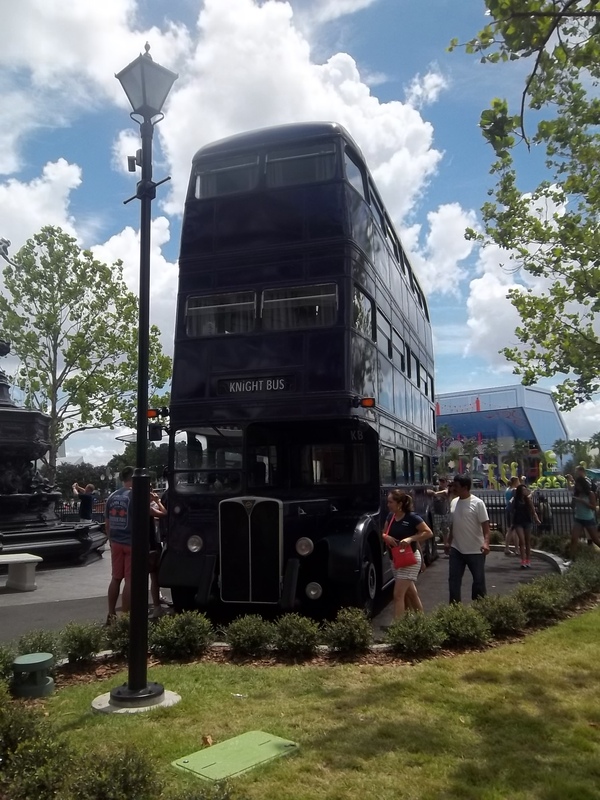 Visitors coming to the area will first see a replica of a section of modern-day London complete with a train station that leads to the Hogwarts Express and the magical Knight Bus featured in Harry Potter And The Prisoner Of Azkaban. To gain entry to the train ride, you need a two-park ticket otherwise you are forced to remain in Diagon Alley and vice versa. The train itself is a perfect rendition of the one seen in the Harry Potter films and can accommodate large amounts of passengers. Once assigned to a roomy cabin, the first thing that strikes the eyes is the passenger-side window that is actually an HD screen showing a brick wall with steam rolling about. On the aisle-side of the cabin, the windows are frosted. After the train leaves, passengers can look out the window and see the London cityscape and surrounding suburbs, but with signs of the malicious Dementors afoot. Meanwhile on the aisle-side of the cabin, silhouettes of Harry Potter and other characters are seen walking back and forth. At one point the Dementors invade the train who are seen as silhouettes, but are quickly dispelled. 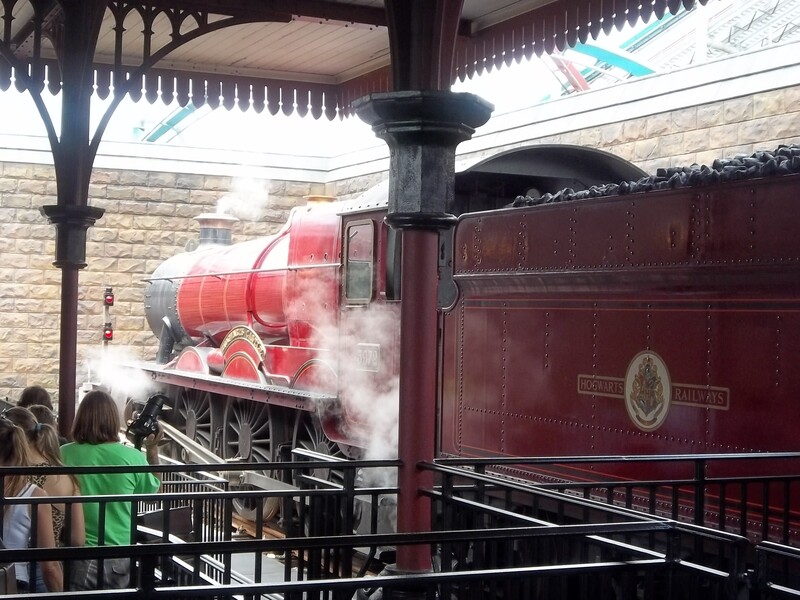 After a few minutes the train reaches Hogsmeade (and shortly before, Hagrid himself appears outside the window striding a flying motorcycle) allowing passengers to disembark onto Islands of Adventure. If you want to go back to London and Diagon Alley, you have to leave the station (which is next to the twin rollercoaster ride Dragon Challenge) and get back on line with your two-park ticket handy. On the way back to London, passengers will witness magical creatures like the hippogriff and centaurs trouncing around the forest surrounding Hogsmeade. Either route provides a nice, comfortable ride between the parks. The character silhouettes and the passenger windows certainly add an interesting touch to the experience. Even though it isn’t an E-ticket ride, Hogswart Express is a novel way to transit the parks. To reach Diagon Alley, you must go behind the facade of London’s buildings through a brick-lined passageway. 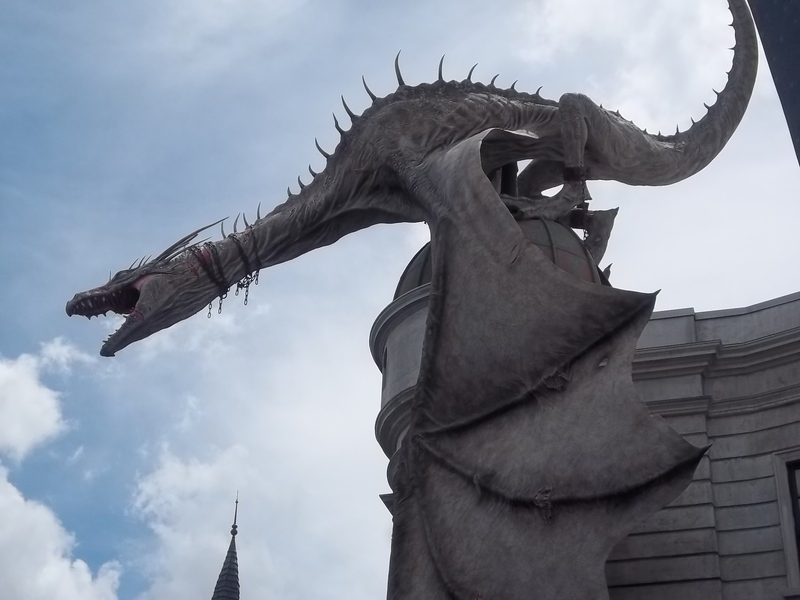 A quick turn around a corner will reveal the cramped and bustling Diagon Alley and at the very end of the main street lies the lopsided Gringotts Bank with a statue of the albino Ukrainian Ironbelly dragon atop of the bank. An impressive sight, the dragon statue also breathes fire periodically. 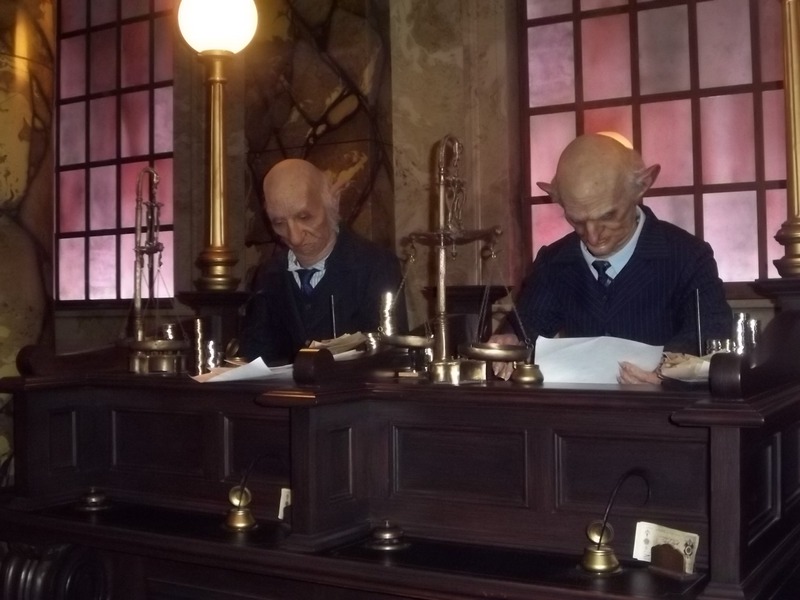 Inside the bank is the ride Harry Potter And The Escape From Gringotts, but before reaching the ride, visitors go through a mammoth lobby that is lined on both sides with animatronic goblin bank tellers working diligently at their stations. The end of the queue lead into a waiting area where an elevator will take you deep underground. The herky jerky movements of the elevator as it descends are a nice touch and help sell the illusion that you’re actually plunging really far down. Once the elevator reaches its stop, it’s time to line up for the ride at last. Basically, it’s a hybrid between a steel rollercoaster ride and those violently moving vehicles used in Universal’s Transformers: The Ride-3D and The Amazing Adventures Of Spider-Man rides. It’s very similar to the Revenge Of The Mummy ride experience. As with the former rides, passengers must wear “safety goggles” that are in reality 3D glasses because for most of the ride, you’ll be watching huge 3D screens. The rollercoaster vehicle, made to look like a large mining cart, controls its speed, allowing it to slow down, stop and change direction. During this ride, Harry Potter, Ron Weasley and Hermione Granger are pulling off a daring bank heist and are trying to escape back to Diagon Alley, while you’re along for the experience. Trying to stop them and you are Bellatrix Lastrange, Lord Voldemort and various trolls. The actors who played these characters in the movies reprise their roles. So getting to the point: is it as good as Harry Potter And The Forbidden Journey at Islands of Adventure? No, it isn’t, the other ride is much more frantic and bursts with more energy. It also feel more innovative, whereas Harry Potter And The Escape From Gringotts is just another variation of the Spider-Man and Transformers rides. Nevertheless, Harry Potter And The Escape From Gringotts is still one of the best rides ever made for any theme park, a bonafide can’t-miss attraction. Like any great attraction, Harry Potter And The Escape From Gringotts fully immerses you into the riding experience, making you feel as if you’re part of the adventure. It’s like you’re actually rough riding a perilous mining cart on winding tracks deep inside a gloomy and expansive cavern. More importantly, the ride is just plain fun. What isn’t fun though are the impossibly long wait times to get on the attraction. It’s best to wait for the crowds to die down at this point unless you think that easily spending most of a day to get on one ride is a good use of time. What makes this expansion so memorable is the design of Diagon Alley itself. This hidden neighborhood seems like the genuine article. Unlike Hogsmeade, which has a spacious and open ambience, Diagon Alley is cramped, crowded and feels lived in. All the magical touches signifying that this is a wizard’s neighborhood are plain to see and complete the illusion that you’ve been transported to another world. While many of the storefronts are just that, facades that aren’t open for business, they add to the magical atmosphere found throughout the place and capture the spirit of J.K. Rowling’s works. Some places that are actually open for visitors include Ollivanders Wand Shop, where fans can buy interactive wands; magic novelty gifts can be found at Weasley’s Wizard Wheezes; Madam Malkin’s Robes For All Occasions has school uniforms and other clothing for sale; Florean Fortescue’s Ice Cream Parlour sells standard and unusual ice cream flavors such as chocolate chili, strawberry and peanut butter, and of course, butterbeer. Speaking of the tasty drink, butterbeer is sold in various spots throughout Diagon Alley, including the Leaky Cauldron eatery, which serves mainstay British fare like fish and chips and bangers and mash. No doubt, it’s very easy to spend a huge amount of time just wandering around and taking in the sights. Even if you can’t make the ride or aren’t a Harry Potter fan, a visit to Diagon Alley is worth any visitor’s time. The loving and meticulous detail that went into creating this hidden neighborhood is something to be admired and applauded. The work done is a testament to Universal Studios Resort’s creativity and skills and is a reminder that they are a travel destination that can easily contend with the other Central Florida travel juggernaut. So come on Disney, hurry up and give us a Star Wars land already!